C’mon, Who Really Wrote it? : William Halstead in 1952. His one and only Hardy Boys book. Was It Revised? : Yes, in 1969 by Pricilla Baker-Carr. Cover: Rudy Nappi. A bit of red and yellow, but mostly we are in the green period. A little too much green for the subject, if you ask me (and if you are reading this site, you are asking me). 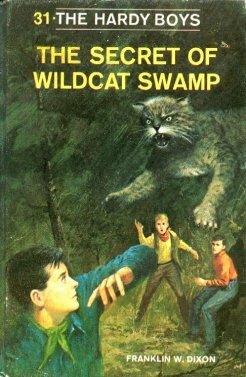 This is another literal episode cover, and it nicely confuses the reader into thinking this book will be about wildcats when it’s really about . . . Setting: Bayport and the West. This is another Hardy Boys Go West story, and this one not only has cowboys, it also has people running around on top of a moving train. Just like Hollywood. Hey, 1952 was Western central. Where’s Fenton This Time? : Back east until it’s time for his usual appearance, but it’s earlier than usual and he and the boys work together a lot more than is typical. Which Chums Show Up? : Chet. Yee-haw! What’s Chet’s Hobby This Time? : None. But, and this is really important, for the first time ever Chet remembers he had a hobby in the past. He actually remembers his judo from 28: The Sign of the Crooked Arrow! Well done, writers! Aunt Gertrude’s Dessert: None. I’m starving. Plot: A teacher in Bayport asks Frank and Joe to come out west to help him with an archaeological dig in Wildcat Swamp. Which when they get there nobody knows it by that name. And a bunch of crooks are, naturally, after that very spot for . . . something. Review: Decent, not a big fan of the Hardy Boys Western series. It’s just adventures out west, not so much of the detective stuff.